This may well be the quietest album I've ever featured on SoundRoots. 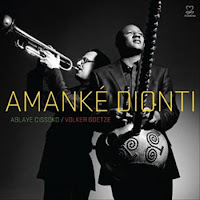 It's a simple duo, the second outing by German-born trumpeter Volker Goetze and Senegalese vocalist and kora player Ablaye Cissoko after their 2008 collaboration Sira. The songs on the new CD, entitled Amanke Dionti, embrace an even more intimate feeling, the three elements -- trumpet, voice, and kora -- blending as if they were created just for this purpose. There's a quality here that one finds in great music and art -- a deceptive simplicity that belies the practice and work, sweat and effort, that go into making any thing of beauty. The remarkable chemistry comes from the duo's extensive touring after the release of Sira. It's a focus that verges on the spiritual. Or perhaps it indeed crosses into the spiritual. “When we play," Goetze explains, "we are simply playing in a state of mind much like meditating. Any great performer knows how to get into his ‘zone,’ and it amazes me that we can stay in that zone for over an hour every time we perform live." 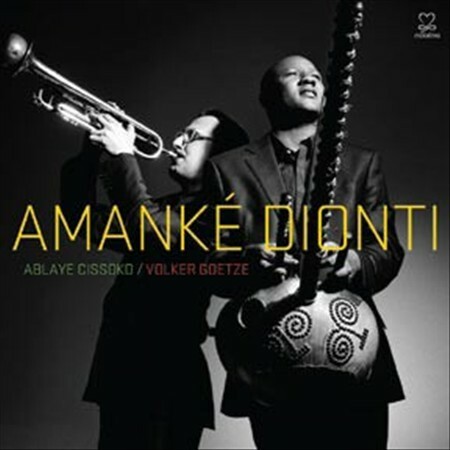 While album's songs are instrumental or sung in Cissoko's native language, the title Amanke Dionti means "she is not your slave,” a reference to the Senegalese tradition of poor treatment of young women who are sent by their families in poor remote areas to serve as maids for more prosperous urban families. There's also a song called "Haiti" about the geological and political devastation of that island nation. The duo's social consciousness is nice to know about, though it may pass most listeners by. What most will focus on is the subtle interplay of these two master musicians, unfolding like the petals of a flower over the course of each of the album's seven tracks. Highly recommended!